It’s that time of year again ~ time to get back to a routine and find order in our houses again! 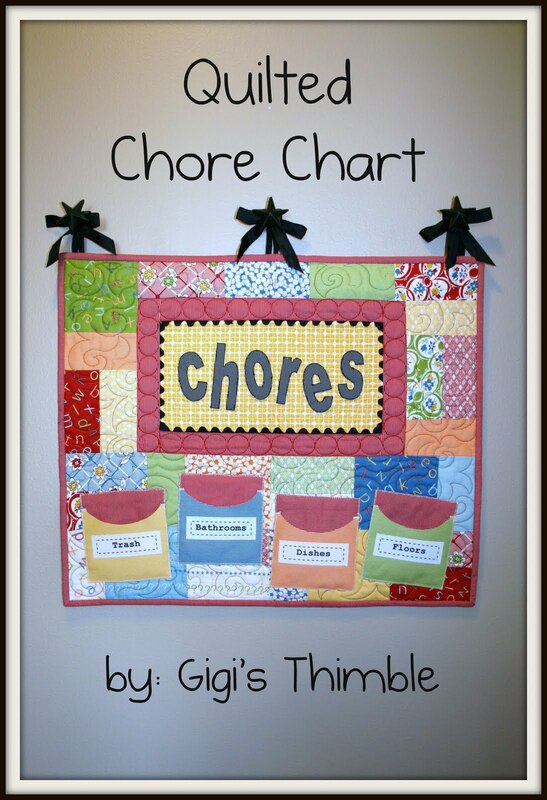 This quilted chore chart is just the way to do it! Note: assume 1/4″ seam allowances, unless otherwise specified. 1. 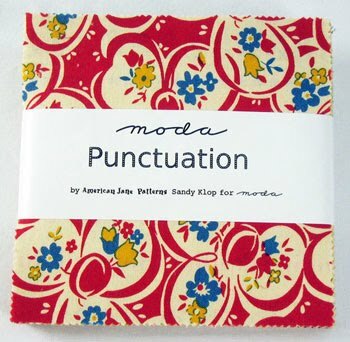 From the yellow fat quarter, cut one 6 1/2″ x 12 1/2″ rectangle. Sew a 13″ piece of rick rack onto both of the long edges, using an 1/8″ seam allowance (see photo below for rick rack placement guide.) Trim off ends. Next, sew two 7″ pieces of rick rack onto the shorter sides of the rectangle. Trim off all excess (including the rick rack that hangs over the edges of the rectangle around the perimeter.) Set rectangle aside. 2. 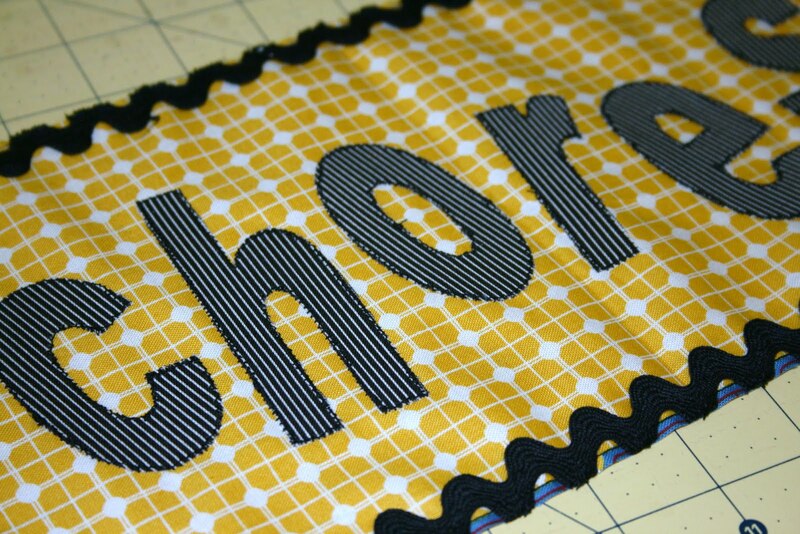 Trace the reversed letters “C-H-O-R-E-S” (which are included in the “printer friendly version” at the bottom of this tutorial) onto the paper side of double sided fusible web. Roughly cut out the letters and iron onto the wrong side of two 5″ charm squares. Cut the letters out on the drawn lines. 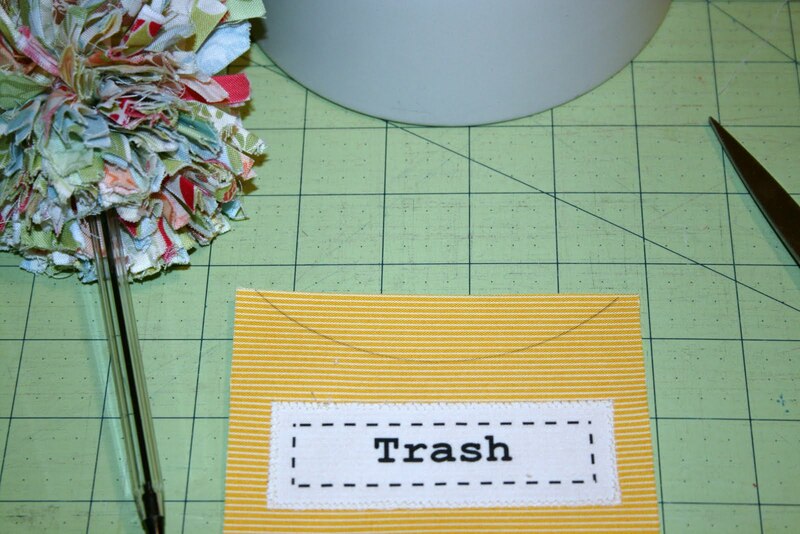 Peel off the paper from the fusible web, lay out the letters on the yellow rectangle and iron in place. 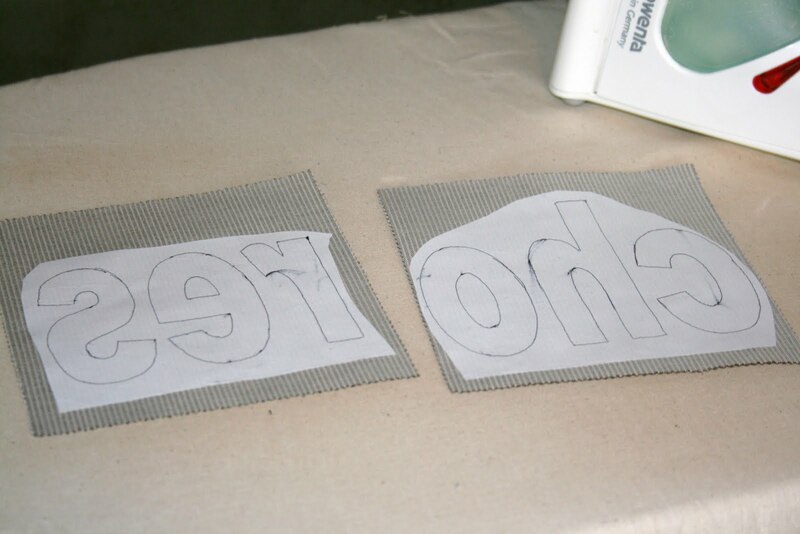 Machine applique around the letters using a small zig zag stitch and matching thread. 3. 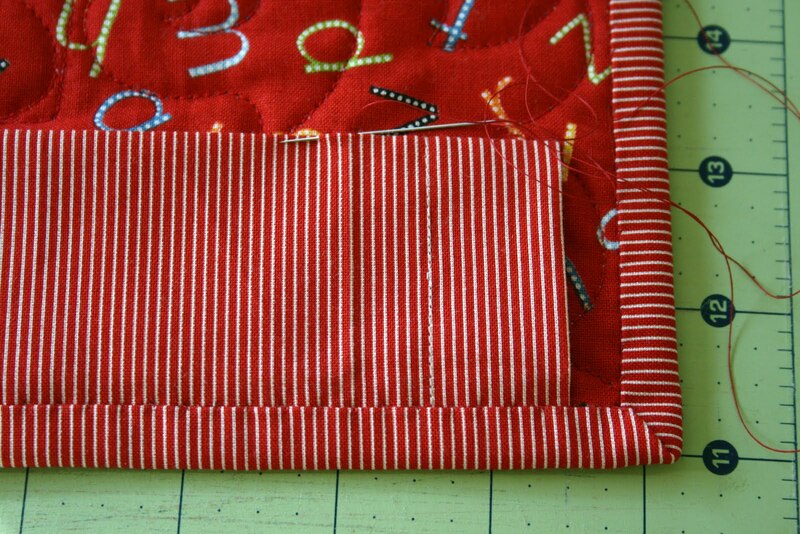 For the red border, sew a 1 3/4″ x 12 1/2″ red striped rectangle onto both of the long edges of the yellow rectangle. Press seams towards the border. 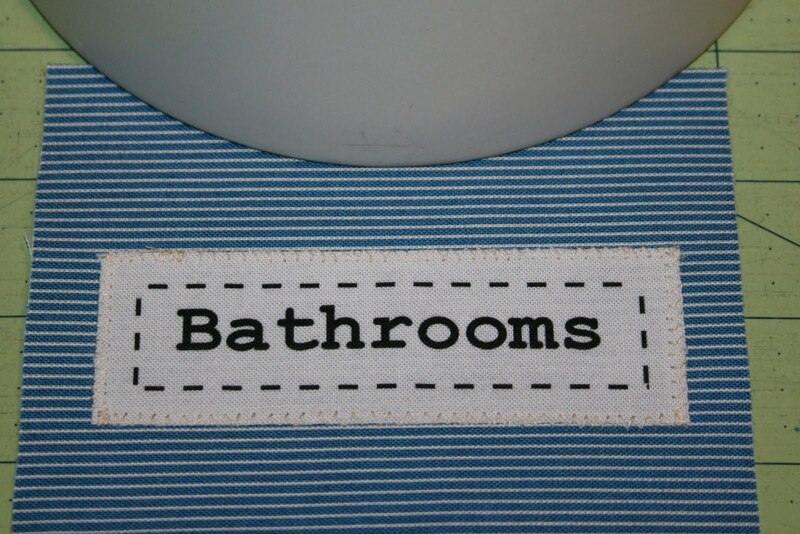 Next, sew a 1 3/4″ x 9″ rectangle onto both of the shorter sides of the rectangle. Press. 4. 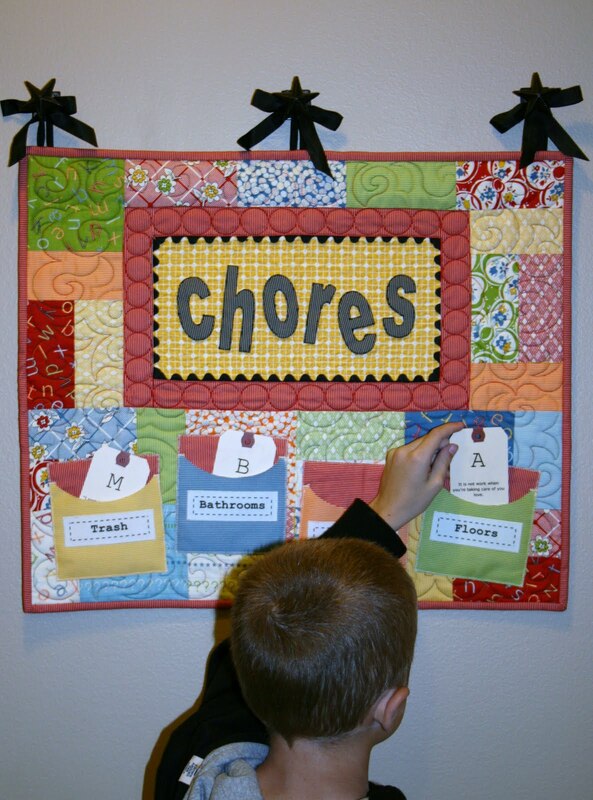 Choose 28 charm squares to use for the main body of the chore chart. Cut 23 of them in half so they measure 2 1/2″ x 5″. 2 1/2″ x 5″ rectangles. Trim where needed. Attach to the right side of the red border. 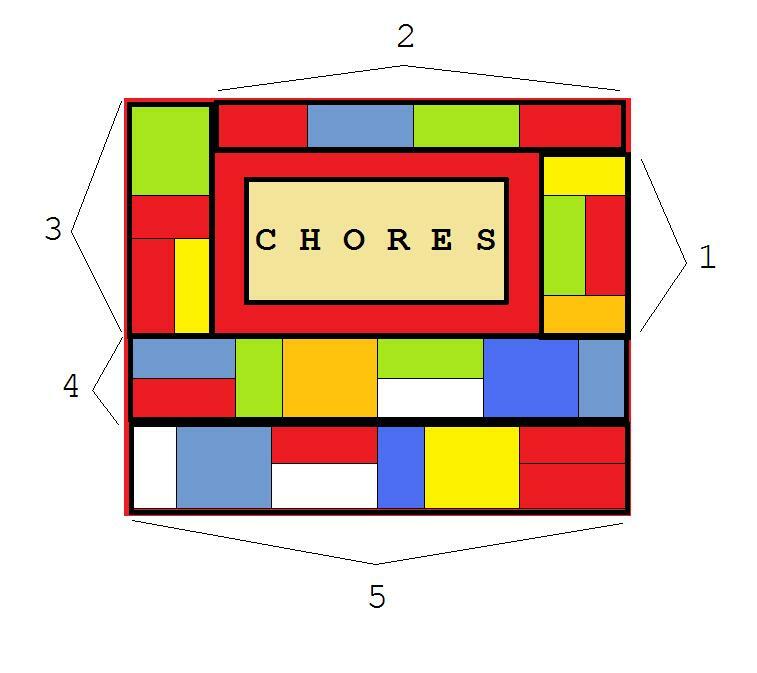 Continue piecing sections 2 – 5 in the same manner, using the diagram below as your guide. 5. Quilt as desired. Trim off excess batting and backing. 6. 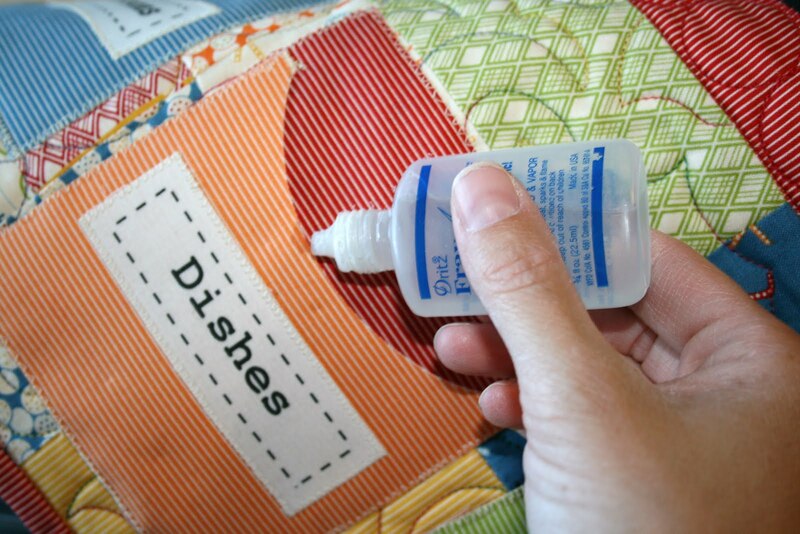 Make pocket lables by ironing a piece of cream fabric (right side out) to the shiny side of freezer paper. Trim both pieces so they measure 8 1/2″ x 11″. Place the fabric/freezer paper in your printers’ paper tray so that the lables will be printed out on the fabric side (the labels are also in the “printer friendly version” of this tutorial). Peel off the freezer paper. 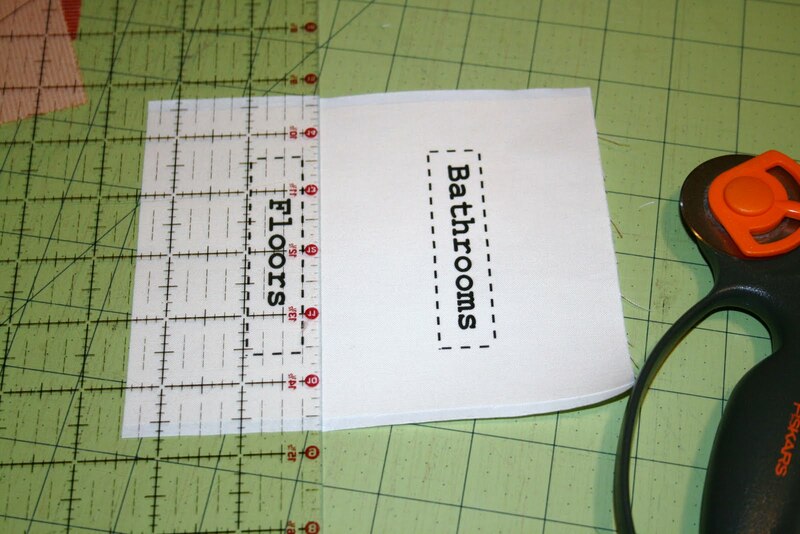 Trim down the labels a little (so that you have about an inch on each side) and iron the label sheet (right side out) to the sticky side of double sided fusible web. 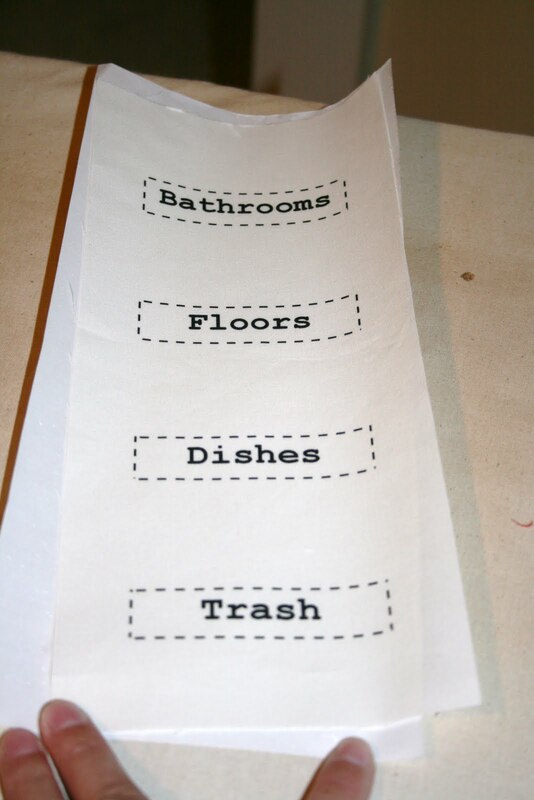 Trim down each label so that there is a one-quarter inch around the dotted lines. 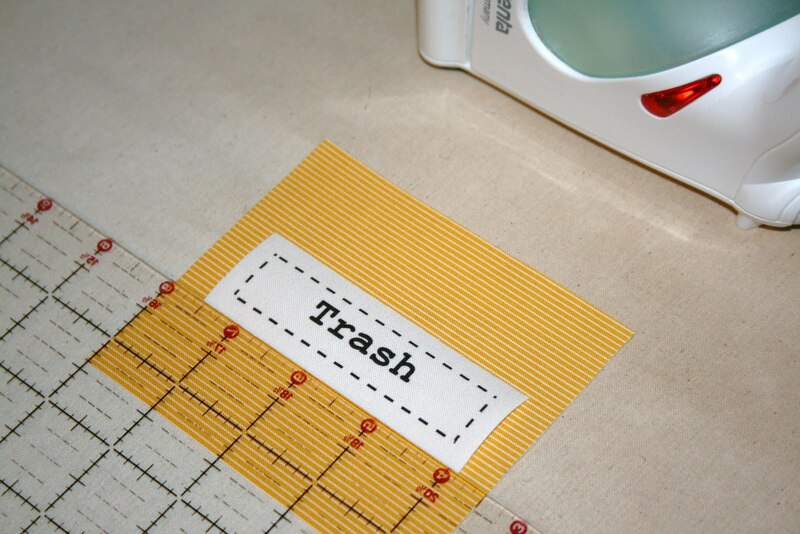 Then set the labels aside while you make the pockets. 7. 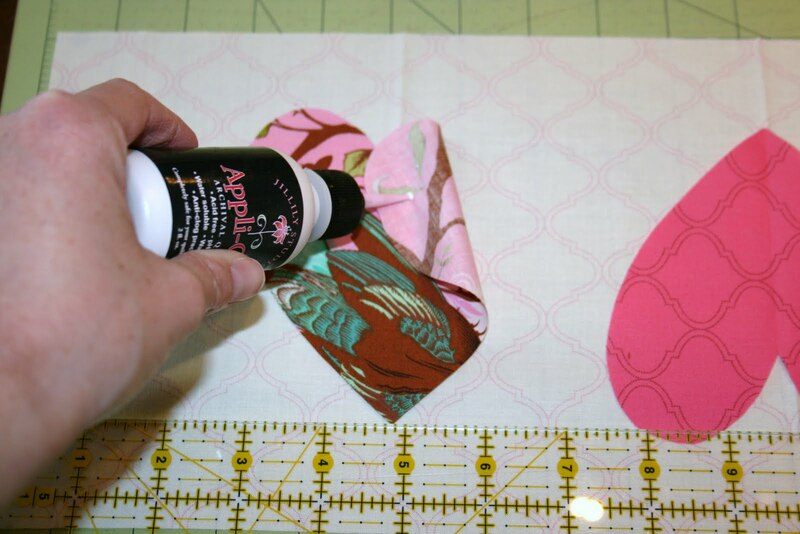 Make pockets by ironing double sided fusible web in between one 5″ charm square and one 5″ square of solid cream fabric (right sides out). Make a total of 4. Trim down each square to 4 1/2″W x 4″H. 8. Center a label onto the colored side of the pocket squares. 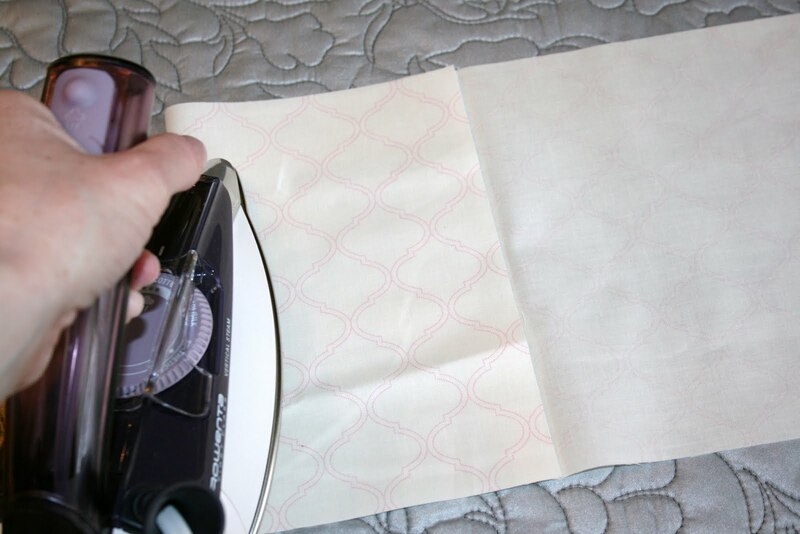 Peel off the fusible web paper and iron in place. 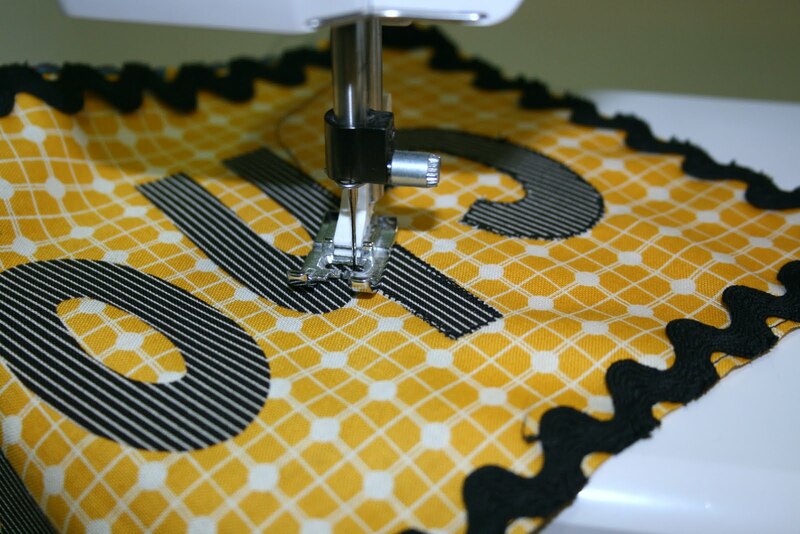 Using a small zig zag stitch, machine applique around all four sides of the label. 9. On the top edge of each pocket, trace the edge of a small bowl to make an arc (leaving 1/4″ on either side of the bowl). Cut on the drawn lines. 10. For the pocket backs, cut out four 4 1/2″W x 5″H red striped squares. 11. 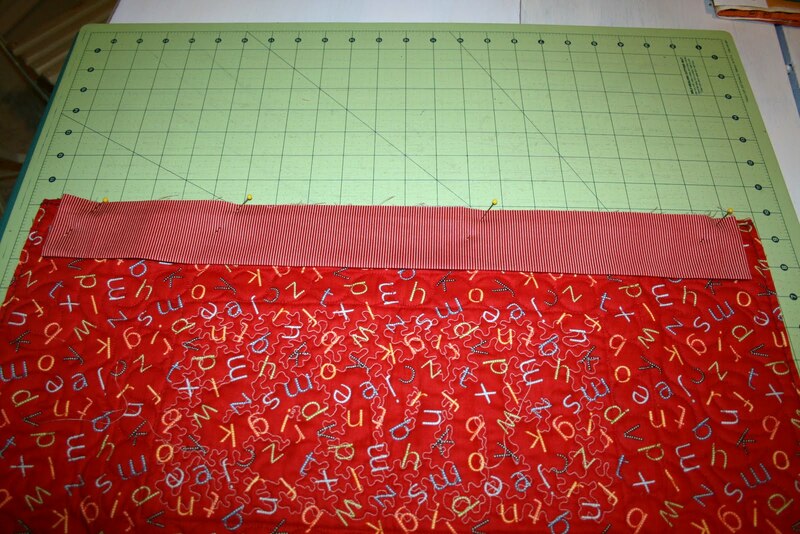 For each of the four pockets, layer together a red background rectangle and a prepared pocket. 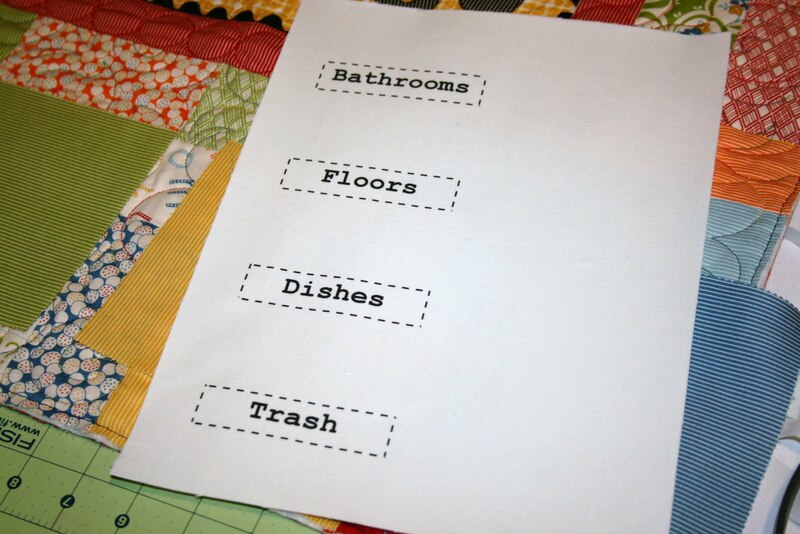 Stagger their placements at the bottom of the chore chart and pin in place. Using the same small zig zag stitch as you used before, stitch around each of the edges of the pockets and red backgrounds (except for the arc). Double stitch over the 1/4″ edges (next to the arcs) for added stability. 12. 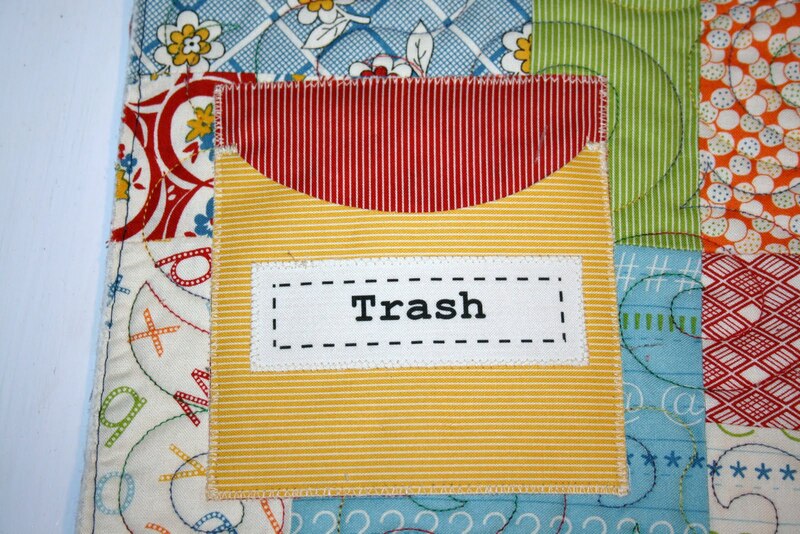 After you have all four of the pockets sewn on, bind the chore chart using four 2 1/4″ strips of red striped fabric. 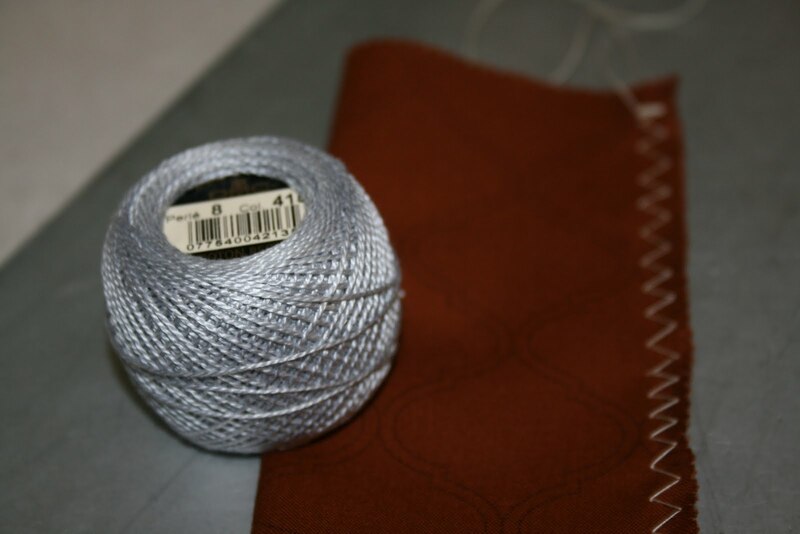 If you wish to hang the chart with a rod or buttons, then make a sleeve and sew that into the top edge of the chart, on the back side [before binding]. 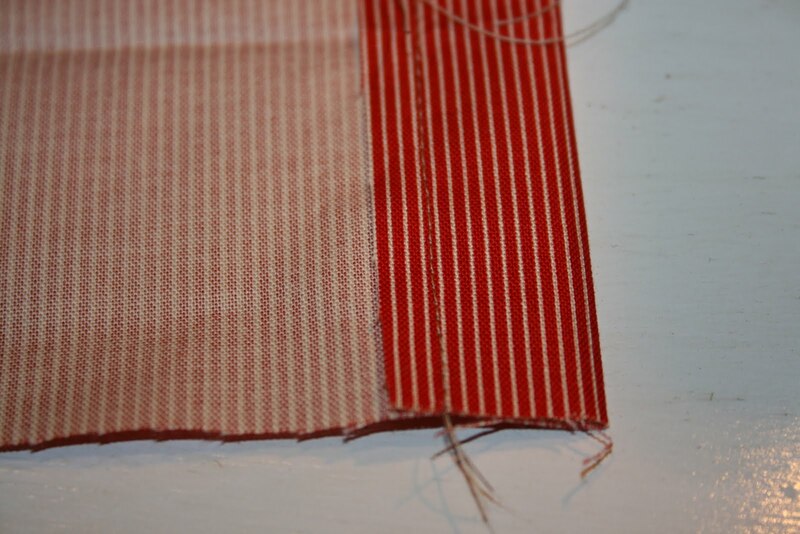 Cut one 4 1/2″ x 23″ strip of red striped fabric. Turn in each of the short ends 1″ and stitch in place. Iron the rectangle in half, lengthwise. Center it on the back of the chart along the top edge (with raw edges matched up with the raw edges of the chart). 13. If desired, put a little bit of fray check onto the raw edges of the pockets. 14. To hang the chart from iron “buttons” like I did, cut your 3 yards of ribbon into three equal lengths, depending on how long you want your bow “tails”. I used a large-eyed needle to thread each of the three pieces of ribbon through the center and each end of the sleeve, but you can attach your ribbon to the back however you like. 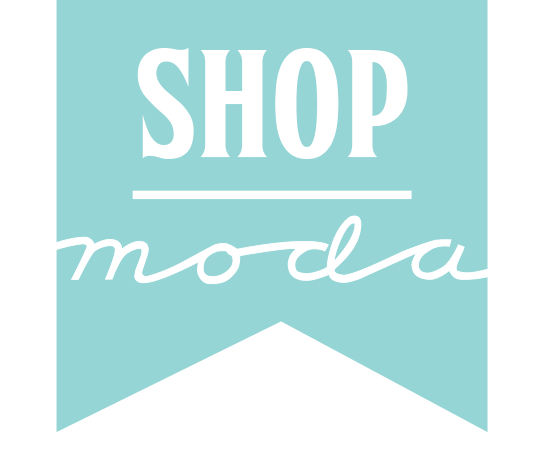 Insert a 1″ x 22″ piece of wood into the sleeve and tie chart to each of the buttons. Or, slide rod through sleeve and attach to wall. 15. 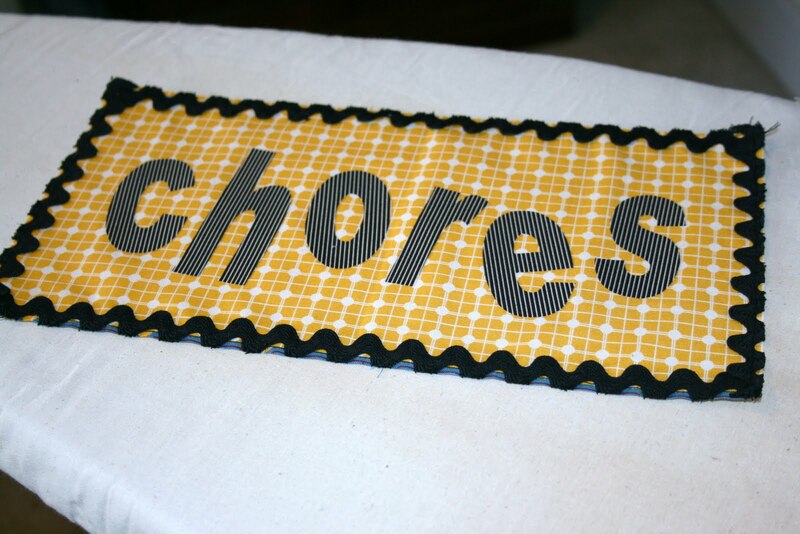 Make tags for each member of your family and enjoy your new chore chart! 2 new quilt patterns will be available soon! 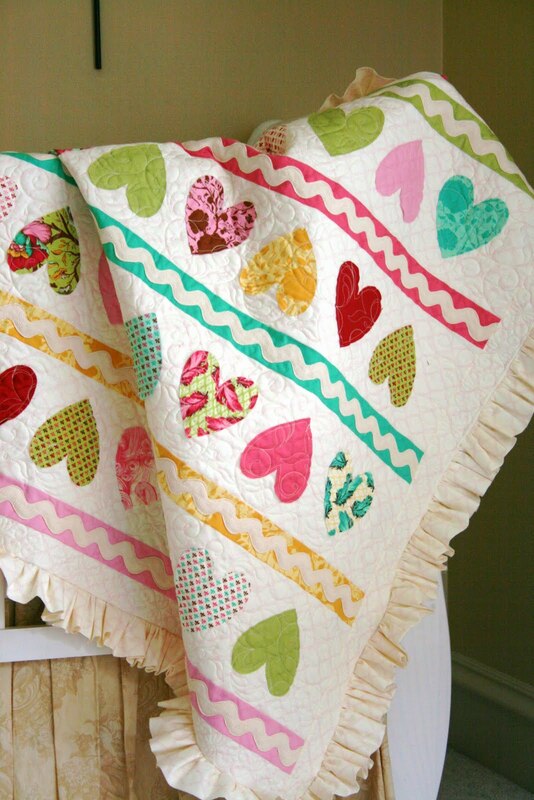 This quilt is perfect for that favorite little girl of yours or even as a whimsical Valentine’s Day throw. Bind it or add a ruffle for extra charm! 1. 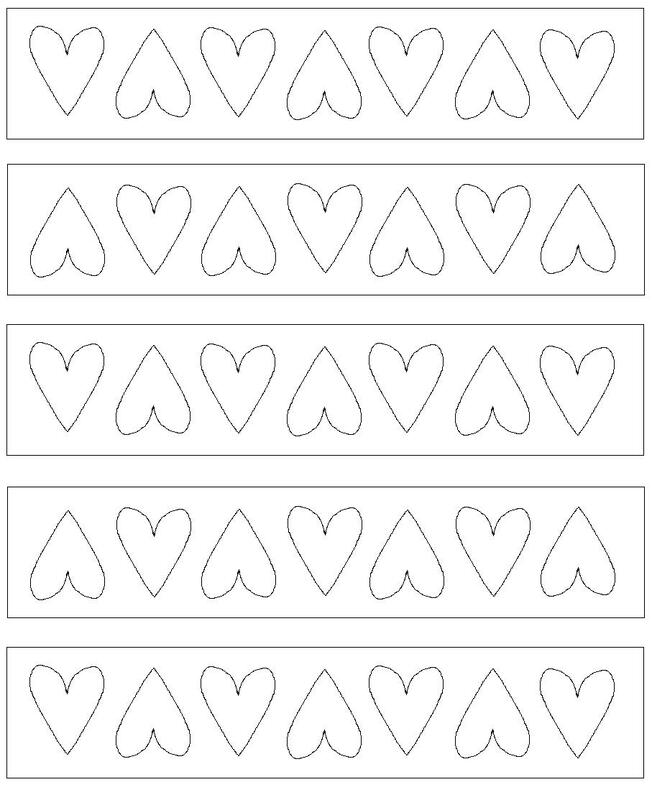 Create a heart template by cutting a 5″ square piece of paper. 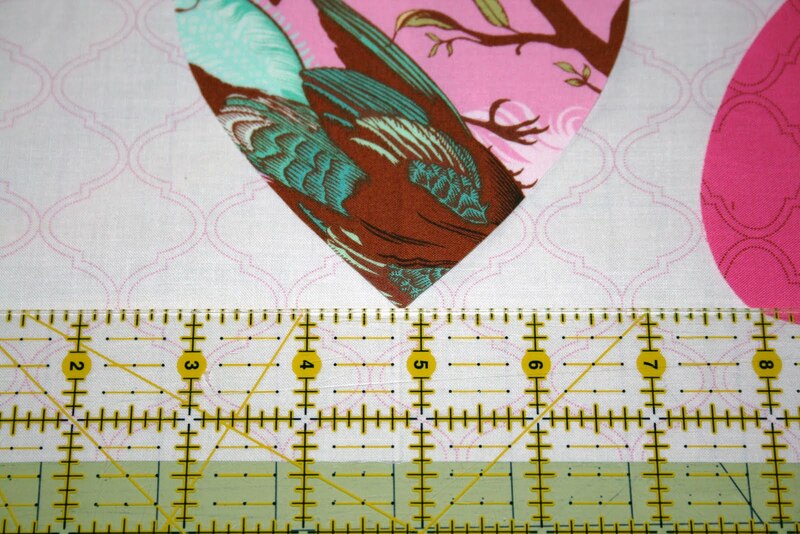 Fold it in half and cut out half a heart that measures exactly 4 3/4″ from top to bottom. 2. Fold one charm square in half, right sides together. 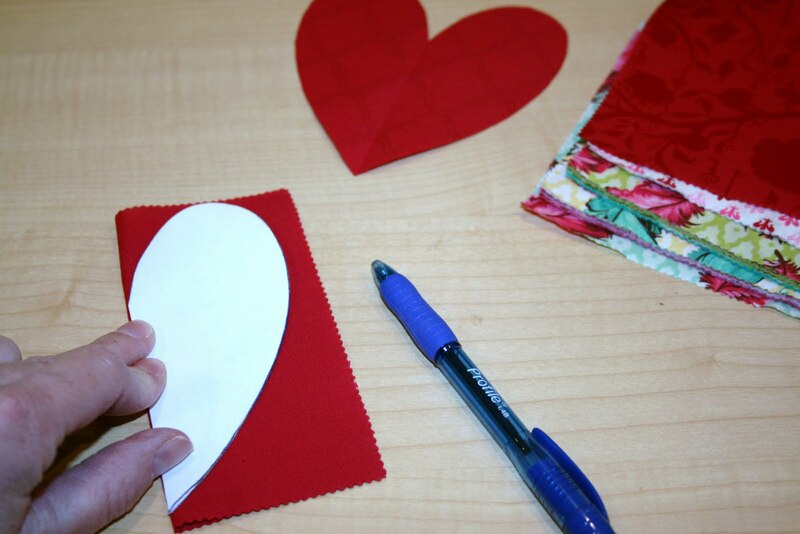 Place the folded heart template on the fold of your fabric and trace with a pencil. 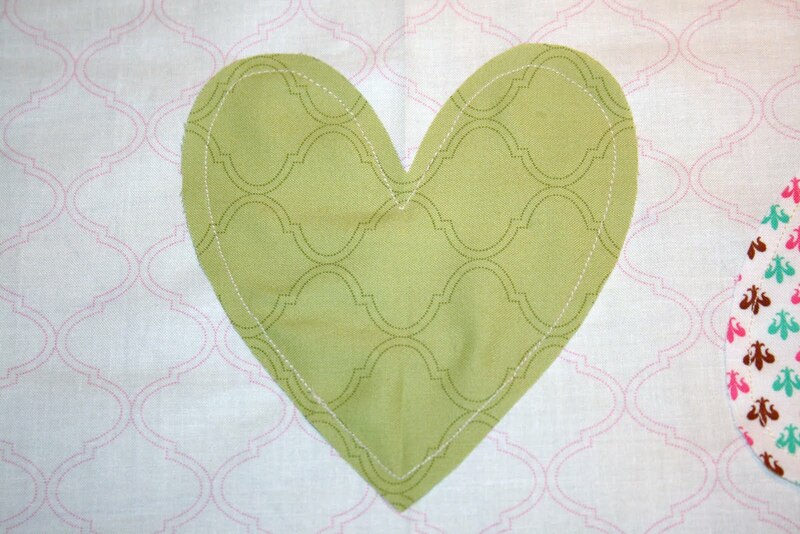 With fabric still folded, cut out the half-heart on the traced line. 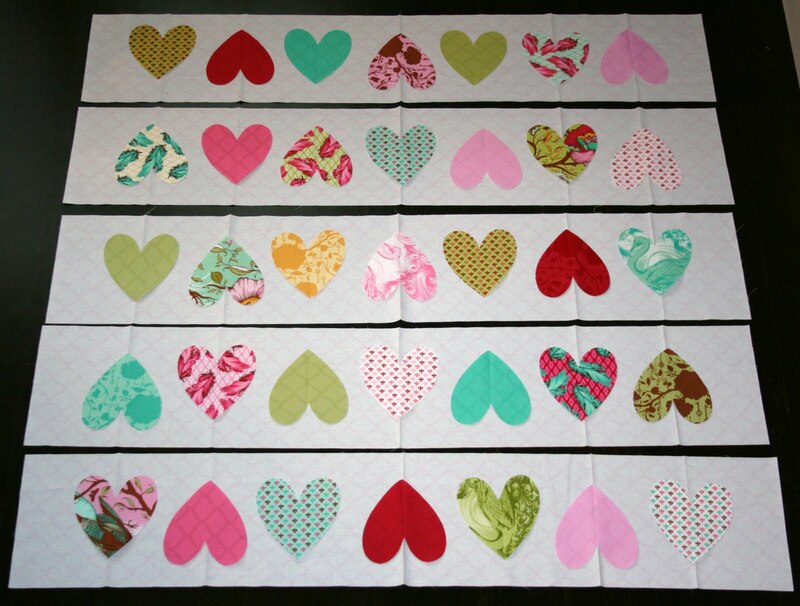 Repeat with 34 more charm squares to make a total of 35 hearts. Set hearts aside. 3. 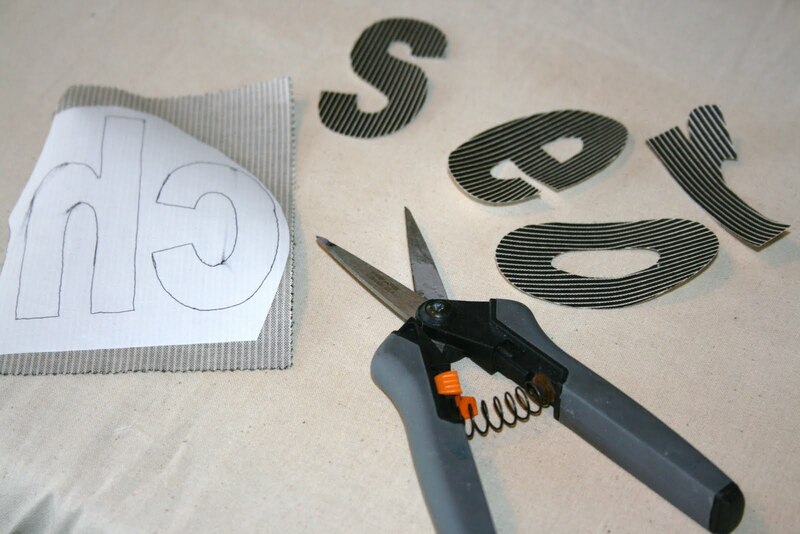 Cut out five 7 1/2″ x width of fabric strips out of the light background fabric. Trim each strip down to 40 1/2″. 4. To mark the placement of the hearts, fold each strip in half and iron on the fold to mark the center. Then fold the two ends into the center mark and iron on those two folds. 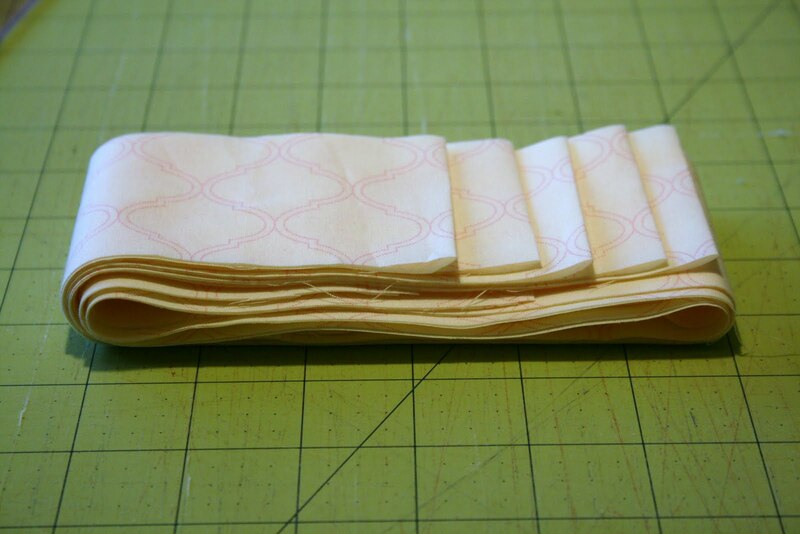 Lastly, fold the two ends in again meeting at the last two fold marks, creating a total of 5 fold marks in the strip. 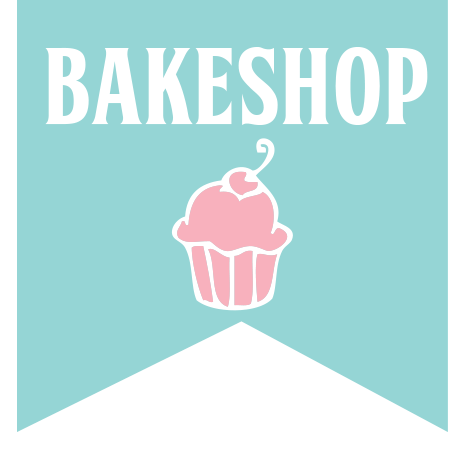 The placement for the last two hearts is exactly 5″ to the right of the second fold mark and the fourth fold mark. 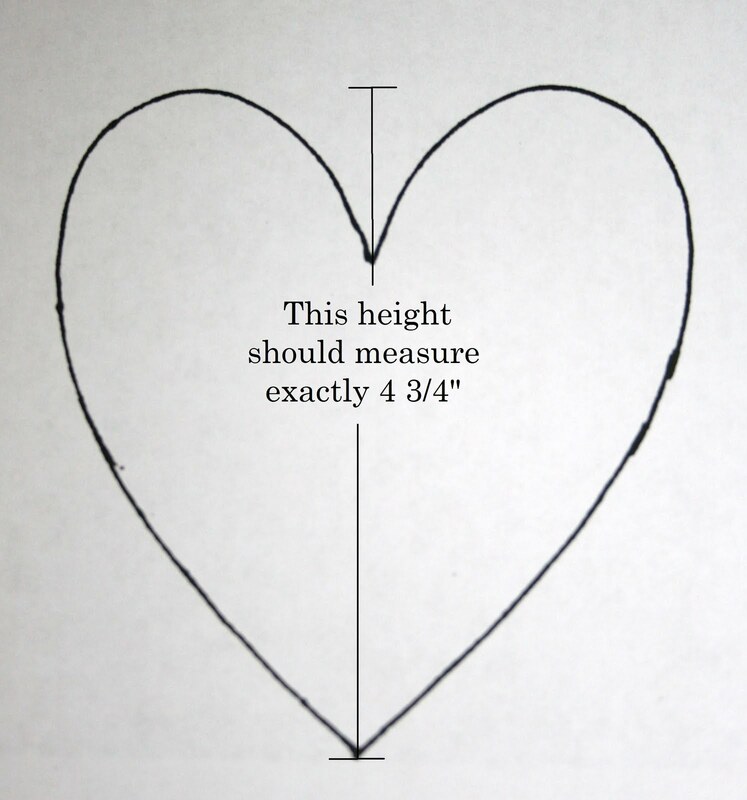 Use a clear ruler to measure 5″ away from those fold lines and then line up the center of the two hearts there. 6. Center the heart on the fold marks with the point of the heart 1 3/8″ away from the edge of the fabric. Pin or glue baste into place. I used a few dots of Appli-glue on each half of the heart. 7. 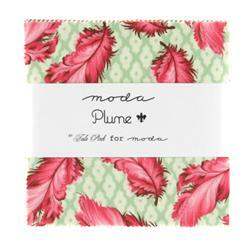 Sew 1/4″ inside edge of hearts creating a raw edge that will fray when washed. 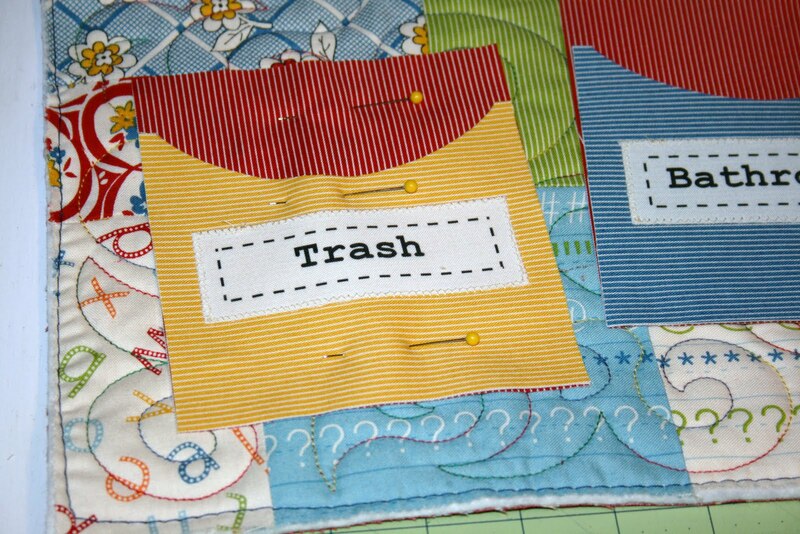 Clip threads on front and back. Repeat for all 5 strips of hearts. 8. 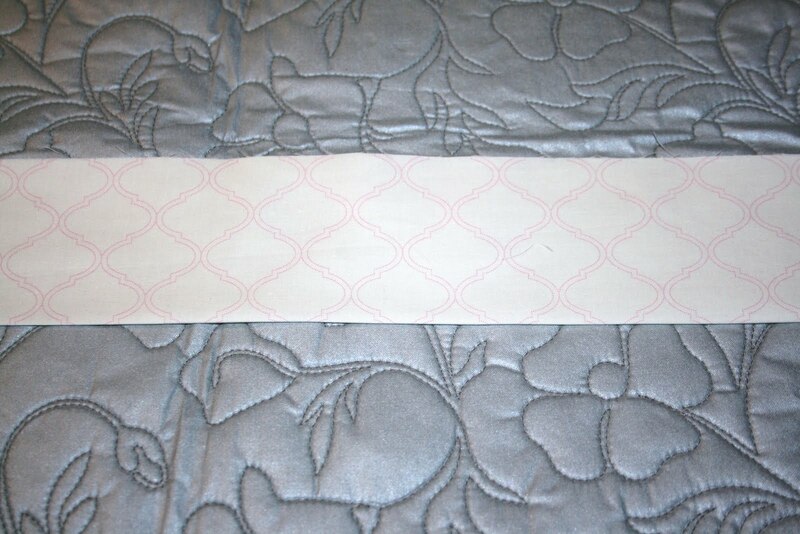 For sashing: Use a pencil to mark a line down the middle of each jelly roll strip. Pin or glue baste a piece of ric rac onto the marked line, leaving an inch or two on either end in case of fraying (trim just before sewing on borders). Outer curves of ric rac will be about 1/2″ away from edge of jelly roll strips. 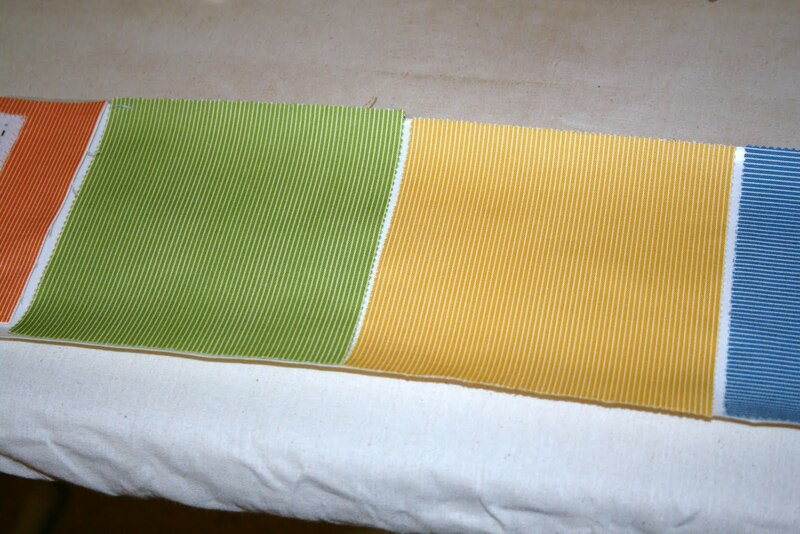 Stitch down the middle of the ric rac using a thread color that blends. Repeat with the other 5 sashing strips. 9. Sew heart rows and sashing strips together, beginning and ending with sashing strips. Press seams towards sashing. Trim ric rac after all of the rows of hearts and sashing are sewn together. 10. 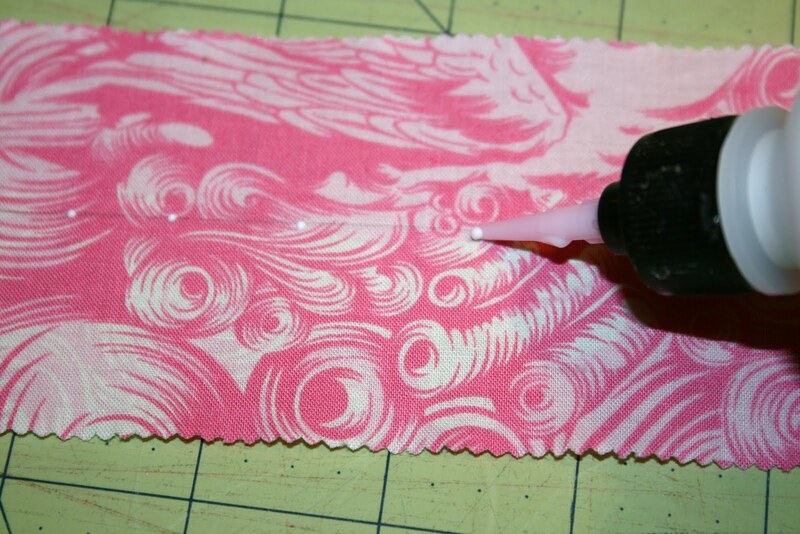 For borders: Cut five 2 1/2″ x width of fabric background fabric for the borders. 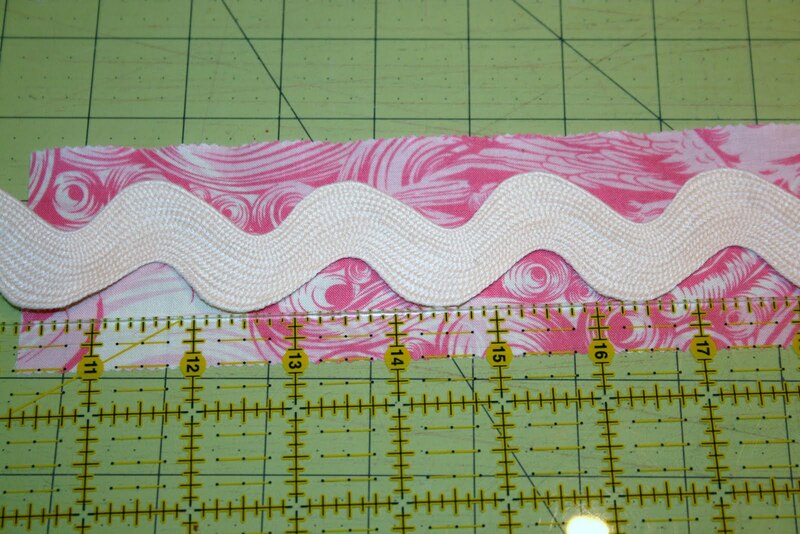 Trim two of the strips to 40 1/2″ and sew to the top and bottom of the quilt top. Sew the other 3 strips end to end. Measure through the middle of the quilt from top to bottom. 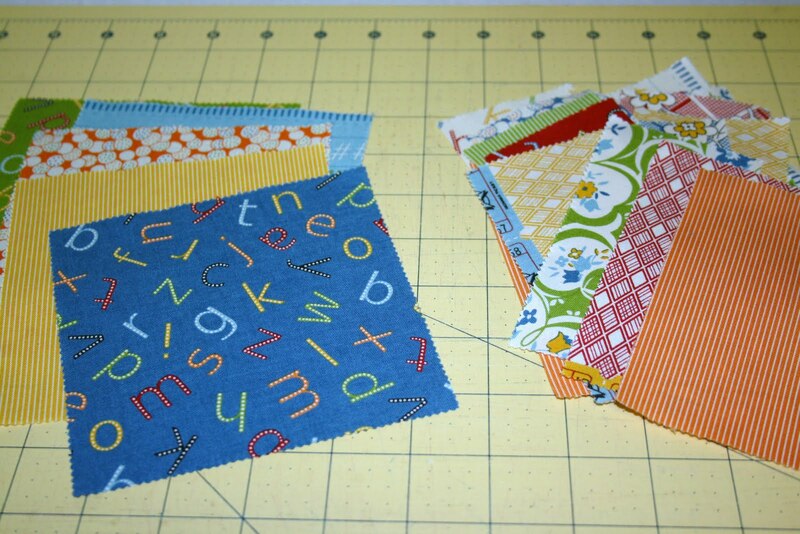 Cut two border strips that length and sew to the sides of your quilt. Press seams towards border. 11. To piece your back, cut your 3 yards of fabric in half to make two 1 1/2 yard cuts. Cut off the selvages and then sew the two long edges together. This will create a horizontal seam on the back of your quilt. You will have some left over, which you could use for your binding if you want. If you wish to do a ruffle, then leave 1/2″ of unquilted space around the entire edge of the quilt. When your quilt is done being quilted DO NOT trim your batting and backing to line up with the quilt top (like you normally would after it’s quilted). Instead, trim the back and batting so that they’re about an inch or so bigger than the top. 1. 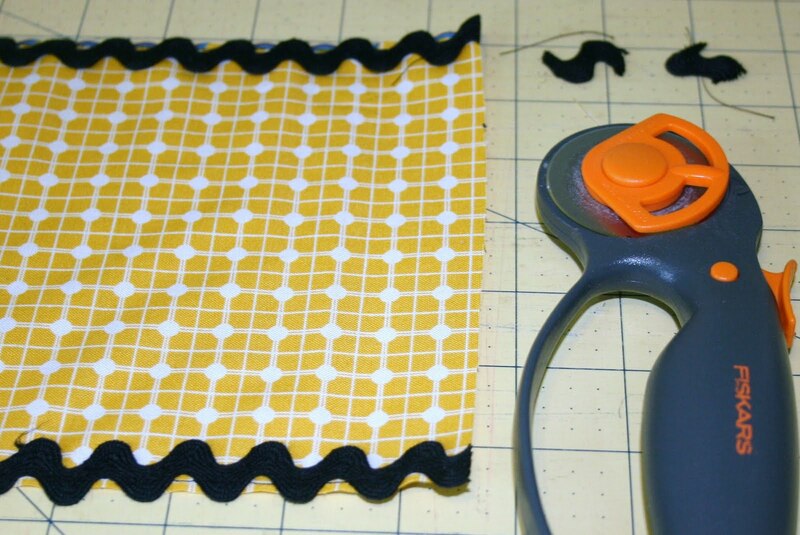 Create the ruffle: Cut twelve 6″ strips of fabric. Cut off selvages. Sew all of the pieces end to end and then sew the beginning and the ending edges together to make one big ring of fabric. Make sure that it’s not twisted. 2. Iron the entire ring of fabric in half with wrong sides together. 3. 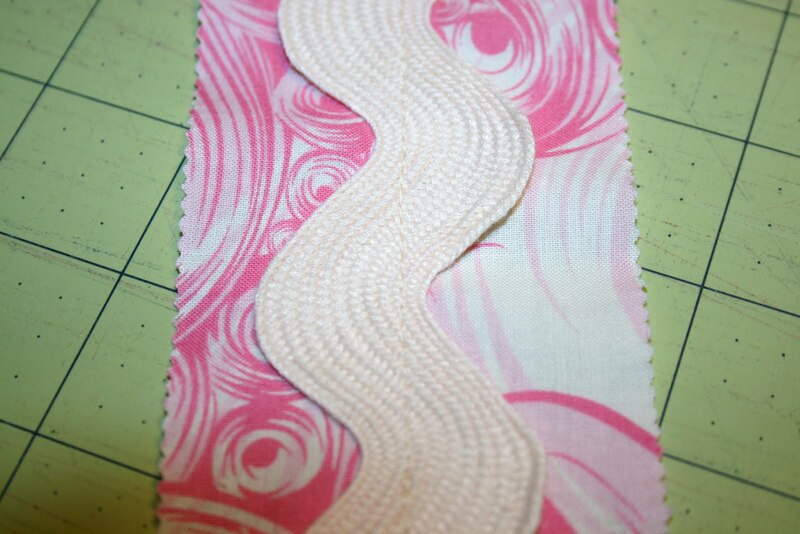 Gather the ruffle: Use DMC floss and a zig zag stitch to make the “pull” to gather the fabric. First, set your zig zag on its longest stitch length. 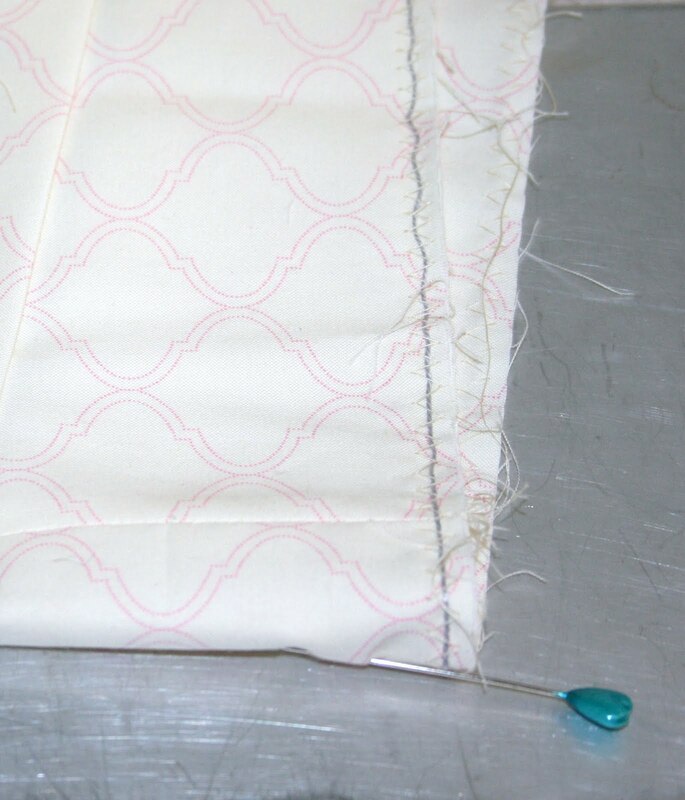 You’ll also need to adjust the width of the zig zag so that it doesn’t go past 1/4″ from the raw edge of the fabric. You might want to do a practice run to get the settings just right. Hold the DMC floss under the center of where your zig zag will be and go back and forth (in place) a couple of times to secure the floss. Leave a few extra inches of floss hanging at the beginning to grab onto when it’s time to gather. Continue centering the floss under the zig zag while you sew the entire edge around your ring of ruffle fabric. Sew back and forth again at the end to secure the floss. Leave a few extra inches of floss at the ending point as well. 4. Mark the two halfway points of the ring of fabric and pin those to opposite corners of the quilt. Working with the fabric between two points, pull the DMC floss while cinching up the fabric. Work with it until the fabric is evenly dispersed over that half of the quilt and then do the same on the opposite side of the quilt. 5. Using a 3/8″ seam allowance, sew the ruffle onto the front of your quilt top being VERY careful not to catch the batting or the backing under your stitches. 6. After you’ve sewn the entire ruffle, on use scissors to trim the batting about 1/8″ away from your seam. 7. Hand stitch the backing onto the ruffle, turning under the raw edge as you go.